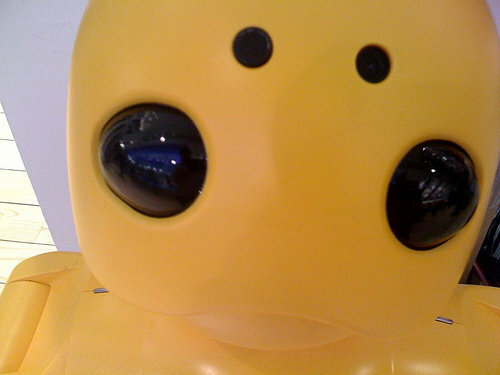 In 2008, given the opportunity by Mitsubishi Heavy Industries in Japan, New York – Tokyo acquired two communication robots named “wakamaru” as their official caretaker in the US. Rather than a standard exhibit, we selected UNIQLO as wakamaru’s work place. 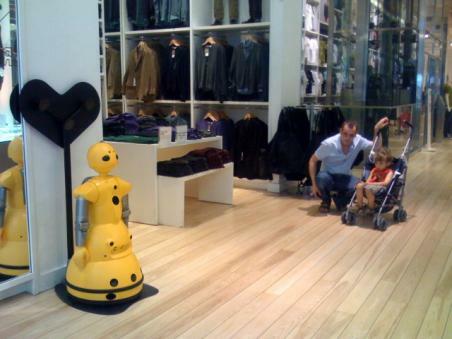 Thus, the first ever retail robot project was born. 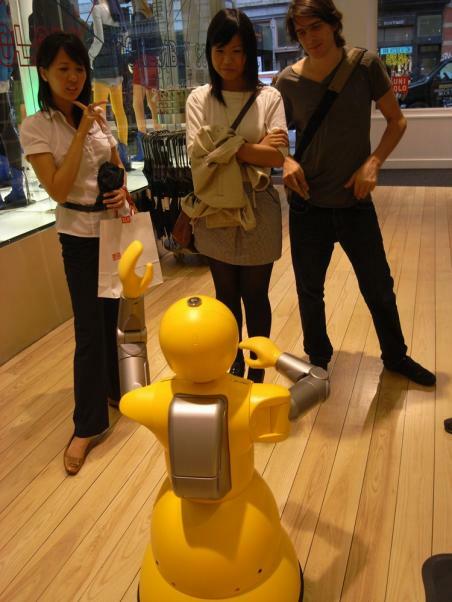 As a retail robot, wakamaru generated huge publicity including NYC taxi cab TV during 3 months’ staying at UNIQLO store, helping the company’s branding of ‘forward thinking’. Despite the hardship of English conversation (wakamaru is programmed with/for Japanese language), what wakamaru did at UNIQL CaO store were as below. * Greeting the customers by eye-contacts and/or sound/voice recognition. * Communicating with customers using voice recognition and speech technology. * Moving around the designed area autonomously. * Playing with customers:rock-paper-scissor, exercise, etc. 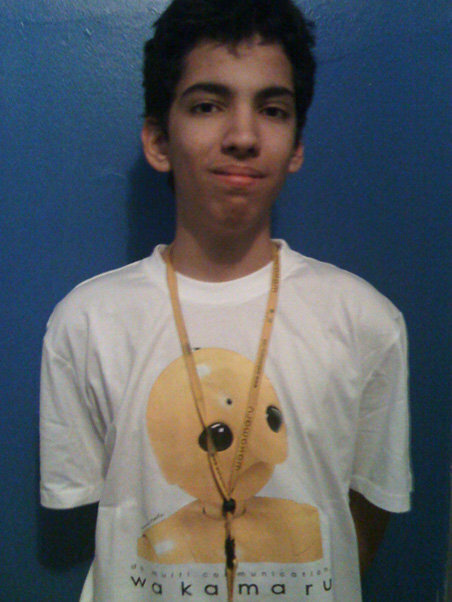 * Introducing the campaign merchandise to the customers, by pre-setting the customized program on him. * Blogging daily life at UNIQLO, here. wakamaru starts his blog on www.newyork-tokyo.com/wp/wakamaru-usa. Check it out how he’s doing everyday at UNIQLO. 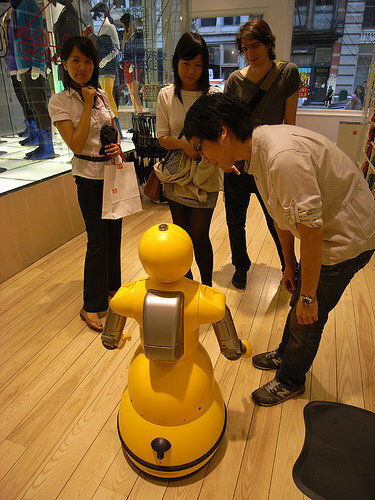 September 1st, 2008 – (New York, NY) – wakamaru, the first robot ever to be featured in a retail store environment, will be joining the UNIQLO team the second week in September. As a forward thinking and intelligent company, this is the perfect initiative for UNIQLO to be associated with. Designed by Toshiyuki Kita and developed by Mitsubishi Heavy Industries, Ltd. (MHI), wakamaru is neither human or machine; it is the first creation of its kind. 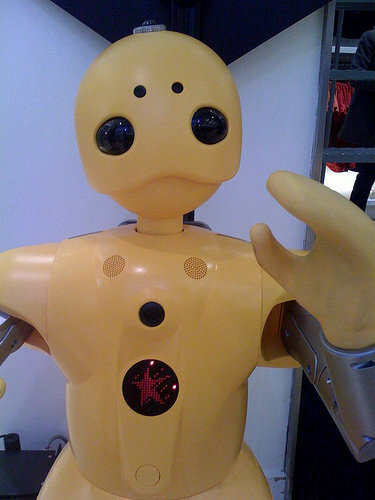 wakamaru’s capabilities include eye contact, basic conversation, ability to recognize people and greet them, voice recognition, and basic arm movements. 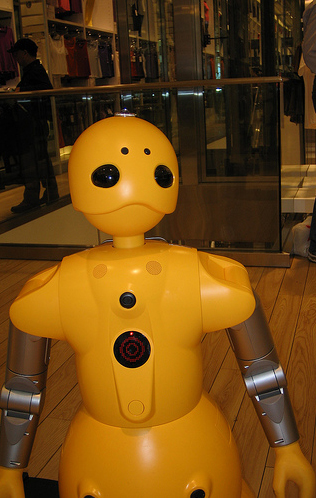 The robot’s name is derived from a famous 12th century warrior who demonstrated phenomenal growth and development, the same of which can be expected from wakamaru during its time at UNIQLO and in the future. wakamaru will hold a unique role in the UNIQLO store. It will lead staff in motivational morning exercises, communicate promotions to customers, as well as greet customers upon entrance into the store. 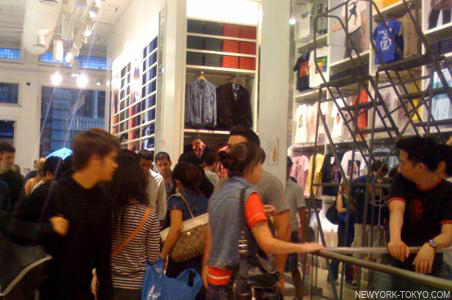 The UNIQLO store in Soho, New York is the perfect environment to introduce such a revolutionary creation. Both UNIQLO and MHI have an unwavering commitment to quality and innovation, making this an ideal partnership. 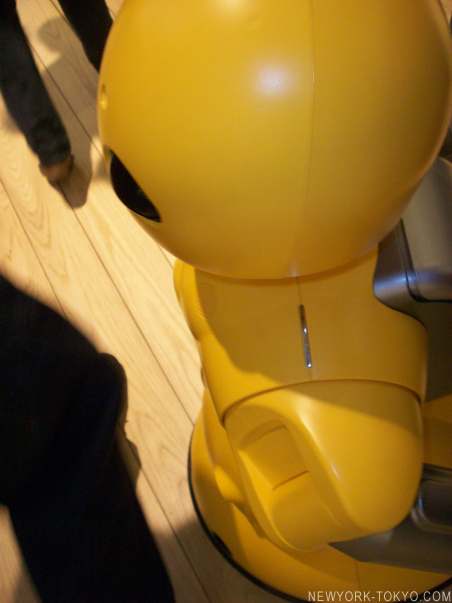 wakamaru’s Japanese roots make the UNIQLO store a perfect place to introduce the robot into the American marketplace. The UNIQLO store will also serve as a platform to expose wakamaru to a multitude of nationalities and cultures.